How Healthy Is Trail Mix? It's fast, it's tasty and easy to make -- and yes, trail mix can be good for you, too. You can just grab-and-go with a handful of trail mix. It offers satisfaction to hunger and usable energy for your body. Just how healthy your trail mix is depends on the individual ingredients you use. 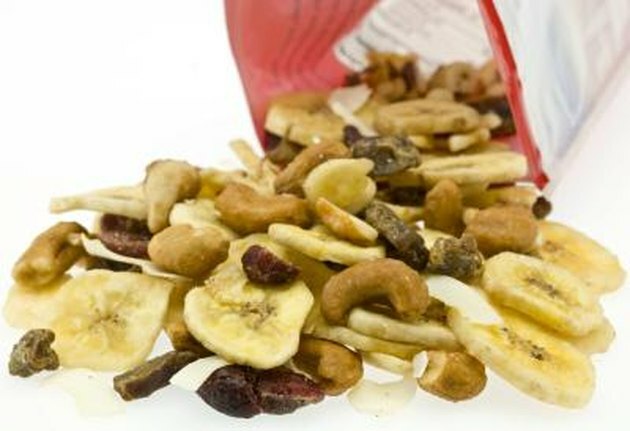 "Trail mix" is the term for a mix of bite-sized ingredients that travels well. Other names for trail mix include gorp, which etymology expert Barry Popik says may be an acronym for "good old raisins and peanuts." Whatever you call it, trail mix typically includes nuts, seeds and dried fruit tossed together without cooking or lightly roasted. It's perfect travel food because no refrigeration is necessary. Hikers, campers and parents of young children like trail mix because it's lightweight, filling and portable. Determining if a food is healthy or not depends on your definition of "healthy eating". Although the USDA's 2010 Dietary Guidelines for Americans are unclear as to what foods to reduce in your diet, they do clarify that increasing your intake of fruits, vegetables, and whole grains is essential to good health. The Harvard School of Public Health emphasizes that you should get your daily protein needs from sources other than red meat, including nuts and seeds -- which are often found in trail mix. Trail mix can be full of protein and vitamins and full of calories from fat, too. Nutrients break down differently. If trail mix is your choice to fuel a day's strenuous hike, quickly metabolized carbohydrates are appropriate. The glycemic index is one way to determine if a food is likely to metabolize -- or turned into energy -- quickly. Some examples of these carbs are pineapples, bananas, and raisins, all of which are used in dehydrated form. Nuts and seeds are the protein foundation for trail mix. Most commonly, you'll find peanuts, almonds or cashews, as well as sunflower or pumpkin seeds in your bag. Naturally, trail mix that's loaded with candy bits or sugar-sweetened dry fruit will offer more empty calories that don't balance out in terms of nutritional benefits. Some mixes use other foods -- like crystallized ginger or shredded coconut -- to satisfy the sweet tooth and add healthier nutrients than candy. Other possible ingredients include granola, which can give you some slower-burning carbohydrate fuel, and pretzel sticks or cracker bits, neither of which is particularly nutrient-loaded. As the Hiking Dude points out, gobbling trail mix is easy to do when you're running around the great outdoors, but too much of anything can also work against you. Check out the nutrition label on store-bought trail mix packages to find out what each brand considers a serving size. Do your body a favor and bring along only a couple of servings for one day's activities. Trail mix tops the list of trick-or-treat alternatives recommended by the American Dietetic Association. The ADA also says trail mix is good fuel for busy young athletes and students -- especially when refrigeration isn't available for packed lunches and snacks. As with any food, if you make your own instead of buying pre-made trail mix, you'll have a better handle on the ingredients and the resulting nutrition potential. You can try some variations on the basic theme of dried fruit-and-nuts, by adding air-popped popcorn, soy nuts, and puffed rice or toasted oats cereal. American Dietetic Association, EatRight.org: What's Growing in Your Lunchbox? Does Eating Brown Rice Reduce Belly Fat?